Our rare earth metal cobalt magnets (TOSREX®) have a high Curie temperature and stable magnetic properties, enabling use at high temperatures. Their residual magnetic flux density (Br) also experiences minimal change with temperature, making them well suited to various sensors that will be used in extreme temperature environments. No heavy rare earth metals are used, eliminating the risks involved in procuring metals such as dysprosium. Our series ranges from high saturation magnetization types to high coercivity types to meet various needs. 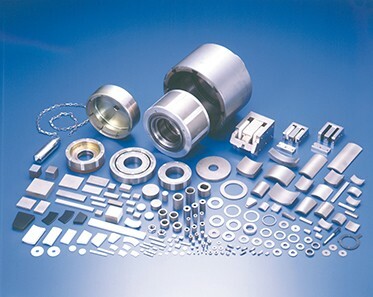 We have also commercialized unique variable magnets whose magnetic force can be changed easily.